Stacy is a marine ecologist who began her career studying vascular systems in colonial hydrozoans, but quickly found seaweeds! During her Masters, PhD and post-doctoral research, she has had the opportunity to work in a diverse array of ecosystems and places: from California to Germany to France to Chile to South Africa to the United Kingdom! Stacy is currently using molecular techniques to explore many different questions associated with the invasion of the red seaweed Gracilaria vermiculophylla. Using a combination of molecular techniques, including microsatellites, single gene sequencing and restriction enzymes, Erik and Stacy, with help from Sarah Shainker and Nicole Kollars, are reconstructing the invasion of Gracilaria vermiculophylla. This species is native to the northwest Pacific, or Japan, Russia, the Korean peninsula and China. Red seaweeds do not disperse far on their own, so something must have transported this species to North America and Europe. Using molecular tools, different populations can be described by a genetic signature. These signatures can be used to trace back from where they came. It is a lot like a puzzle or a "who dun nit". They are currently analyzing one of the most comprehensive data sets documenting an invasion of this magnitude. Even though using fancy techniques can be very informative, so can old fashioned science! Once a month, Stacy has been sampling the mudflat by collecting 100 Gracilaria vermiculophylla fragments. She records their attachment to the substratum (hard bottom) or if the seaweeds are drifting. Then, Stacy has been recording their reproductive state as reproductive (different stages of their life cycle) or vegetative. 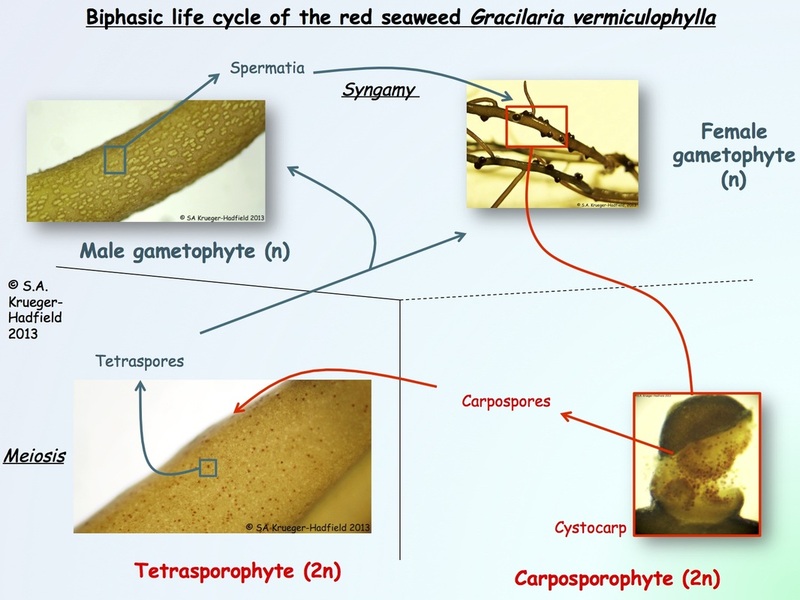 Vegetative means the fragment is not yet reproductive, though many fragments of Gracilaria seaweeds never become reproductive. Below is a life cycle that Stacy created with pictures taken at the Sotka lab.